Citizens and scientists are teaming up on a project along the Boyne River. They’re hoping to create what they’re calling “river forecasts,” that could be used to predict the flow and temperatures of rivers. Both scientists and community members that are hopeful their work could take off across the country. When I find Chris Lowry, the researcher spearheading the project, he’s already knee deep in the Boyne River. He’s wearing a plaid shirt and tan waders, squinting at a box-like piece of equipment that measures water flow. Lowry is a researcher from the University at Buffalo, New York. He says his goal is to set up a sign with a thermometer attached to it so people walking by the river can text him water data. The texts are sent to a computer that virtually plugs the data into a spreadsheet that Lowry and his team will use to build a seven-day forecast for the river. Lowry says building a model for rivers is important to conservation. Lowry hopes his work, which is funded by a roughly 500 thousand dollar National Science Foundation grant and includes scientists from Indiana University and Saint Louis University, will be used to manage rivers across the country - using citizen data to create river weather models that let conservationists know how best to manage the waterways. And, says Lowry, that makes citizens essential to the work. As Lowry talks members of the Friends of the Boyne River drive up and began unpacking their cars. The group works on conservation projects and was a natural fit for Lowry’s research. Adam Kennedy is the president of the group, which he says has existed for roughly 20 years. He says the group enjoys taking the river measurements. 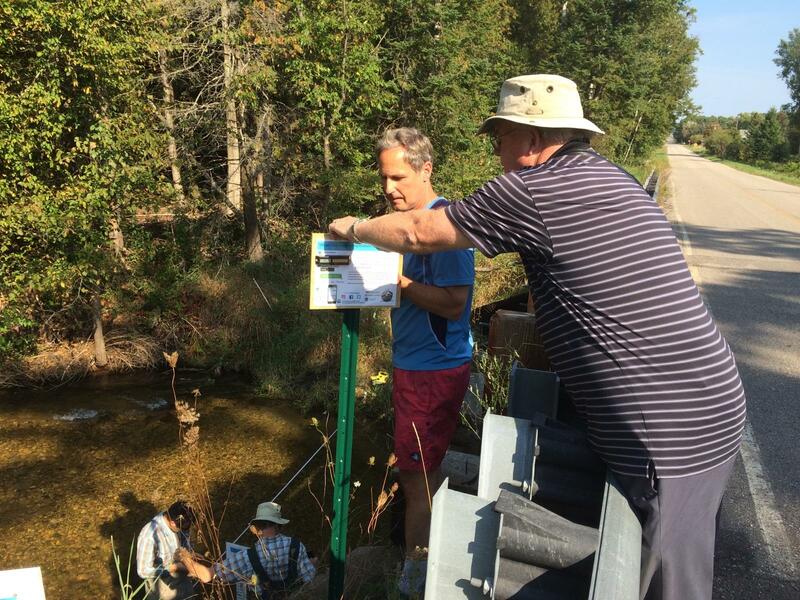 Kennedy and the Friends of the Boyne hammer in a post next to the river and put the finishing touches on a sign with a thermometer, its long wires trailing into the stream. Mike Durbin is another member of the group. He says this kind of conservation is important. The sign complete, Lowry and I take a reading of the water temperature and text the information to the number listed on the sign. I make Chris turn on the sound of his phone so we can hear the text send. The signs first few measurements logged, both citizens and scientist will head to a barbecue in Boyne City. Together, they hope their work will help protect the Boyne River and rivers across the country. But for now, both are happy to share a hot dog and a cold drink.